The snow itself is lonely or, if you prefer, self-sufficient. composed of one thing and one thing only. So beautiful! Want to visit this divine landscape myself sometimes! Great photos , lovely journey . have a lovely week, arti. Lovely pics! Thanks! There is snow on top of 2 of our highest volcanoes in Hawaii, also. I last saw snow in New York City back in the 1970s when I was student there. Don't miss it, believe me. lol. I feel like having your photographs made into posters to decorate my rooms. They are fantastic and soothing to the eye. I have never traveled to that part but I wish to, if health permits. Thanks for sharing. It has been a while, I could peep into the blogs.. Kinda busy at work.. I am glad, I did.. Very nice photos..! Beautiful mountains, terrific captures as always and I love the snow! What a terrific post for the day, Arti! Thanks for sharing the beauty! Hope you have a lovely evening and a great week ahead! Fourth shot is mind blowing, Great compilation Arti! Beautiful ~ thanks for the virtual tour my dear! Nice to see the snow there! What a gorgeous photos! All of photos of Himalayas are so grand. I see there is no green on the majestic neelkanth peak...because of dry or cold weather...? 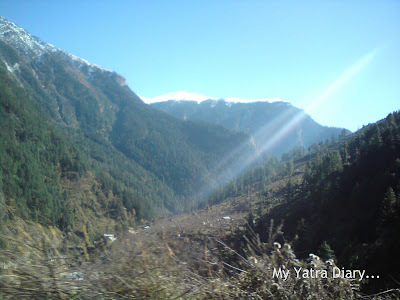 I love the light in Garhwal Himalayas Highway!I enlarged the photo to enjoy it. Have a great week ahead,Arti. Lovely pictures Aarti...for a long time I have been wishing to got here, but so far god hasnt fulfilled my wish..the place looks so divine..
lovely pics, Arti! btw, i sent u a mail.. did u get it? else will send again! Amazing pictures. 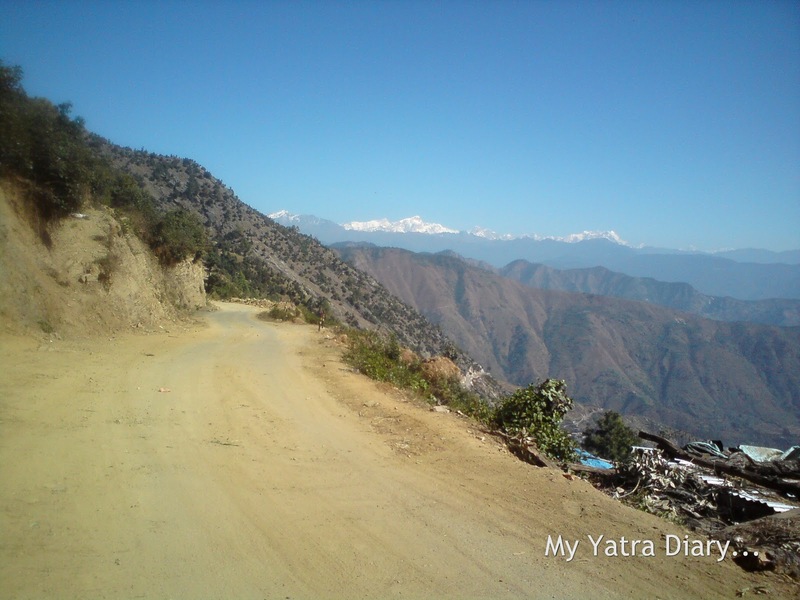 i must visit the Himalayas in all its grandeur, especially in spring:) Thanks for the beautiful photos. you are welcome to my new post,pls share your valuable thoughts with us. Thank you, this made my heart sing. What else is there to say apart from thanks, I also loved these pictures. Loved the pics. They reminded me of my journey to Badrinath and other places in Garhwal Himalayas quite a few years ago. 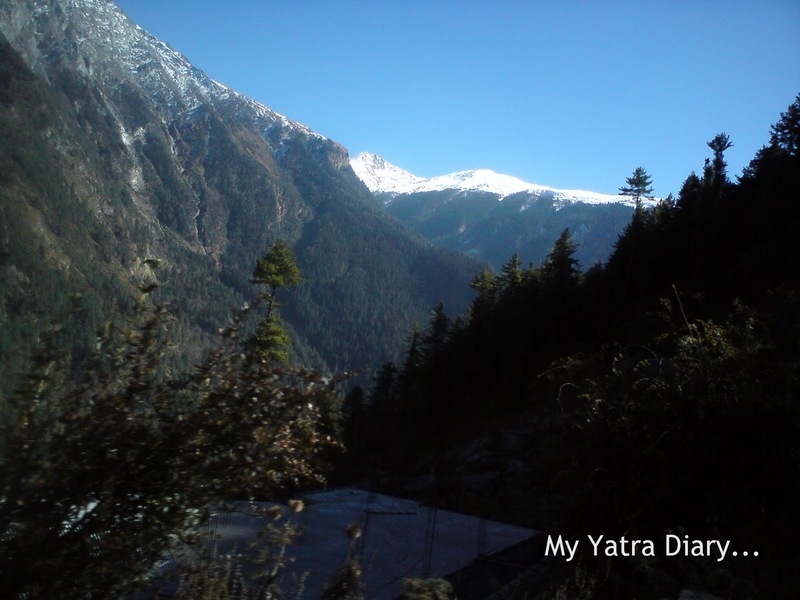 Oh, your photos of your snowcapped peaks are wonderful, Arti. I am surrounded by snow, too, and appreciate its cold beauty. That last road has quite the drop off - don't be staring at the peaks and miss the curve! Very beautiful pictures. I guess when you think of the Himalaya Mountain, you never think of towns being included. Thank you for your kind comments and prayers. I always enjoy your blog, so interesting. though your photos are filled with snow, I can see how you would be warmed by looking at them - the memories you must have of the wonderful journey. the light is fantastic. must be the elevation. or...perhaps it's divine intervention. happy day to you Arti. take good care now. What magical pictures! I do love snow - it is pure magic - but it does create chaos over here when we get too much of it! There is nothing more beautiful than nature things. 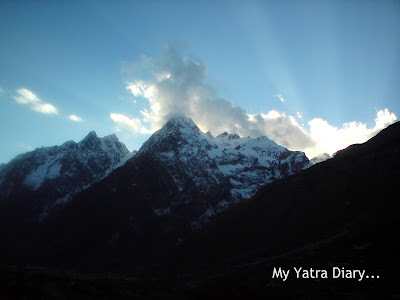 Most magnificent pics from Himalayas.You were close to God Almighty. Thank you for coming to my blog at once. Although North Japan has much snow for a whole winter or so, we have only some time in a winter in Nara city. So snow is unusual for me. so I like snow,too. I think shining of snow on the Himalayan peaks is clean,gorgeous and it's so divine beauty that I feel awe to close it. Hi, Arti! I feel something warm in my heart to imagine how you felt and what you thought when you saw these sceneries. Snow capped mountain peaks, light, blue skies, trees...everything is so beautiful. I especially like the second and the last photo among your wonderful selection. Be happy and healthy. Beautiful pictures and very true quote Arti. I liked your blog very much. I appreciate for your wonderful post. The pictures of Himalayas are absolutely breathtaking. Very nicely described and excellent shots taken by you. Brilliant post. 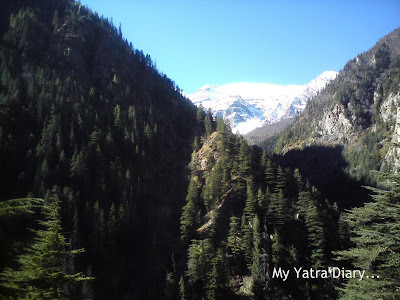 Arti, Everytime I see your photo albums I am reminded of my treks to these destinations! Such amazing places they are... Harsil is called as an equal to the Swiss meadows! It's great that he arrived there! The pictures you are amazing! Wonderful scenes delighted my heart. posted by you Arti ji( sorry Arti). automatically.Is it my fault ? I hope you would not mind,Arti..,(ji). That's an incredible and fascinating landscape to this Aussie visitor used to small hills and flat deserts! You wouldn't want to make a wrong move on the highway in the last picture - it'd be a long way to fall if you went over the edge! 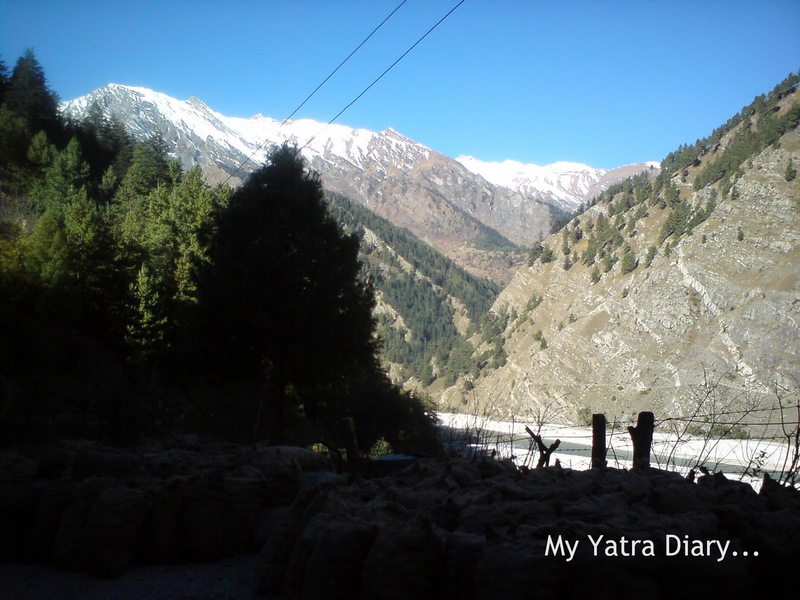 Peaks of Himalayas crowned with snow are divine! Snow changes sceneries very much and seems to add some messages. Contrast between green plants and peaks covered with snow is so beautiful. Neelkanth Peak looks a gigantic rocky peak. Is this a village I can see at the forefront of the picture? It looks quite high altitude. The picture where the ray of the sun glowing behind the clouds over the towering peak covered with snow is so marvelous! 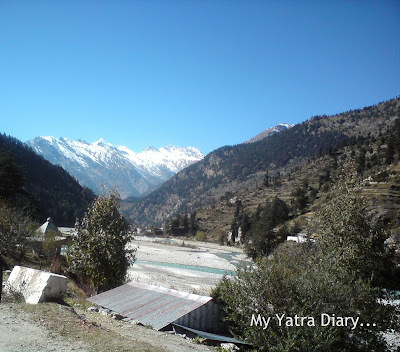 Yes, that is a village in front of the snow clad Neelkanth Peak. 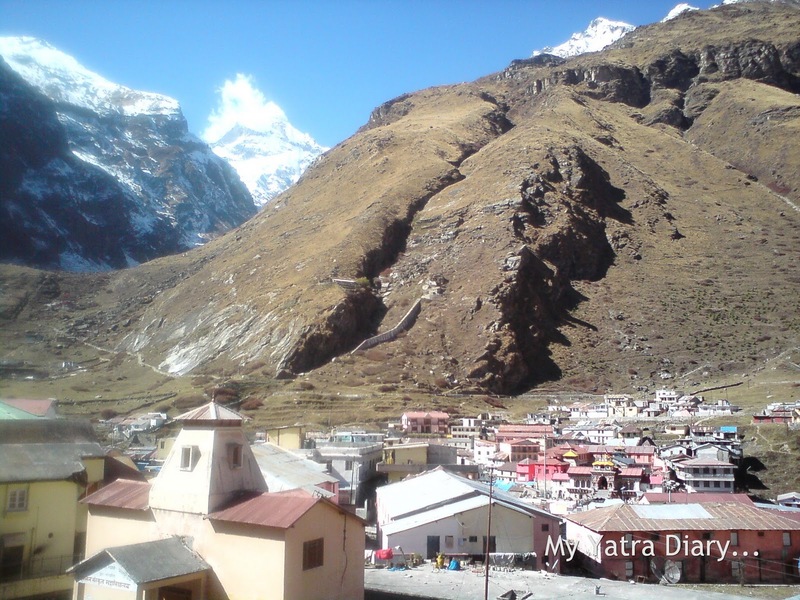 Its Badrinath, one of the holiest Hindu pilgrimages situated over a 10000 feet in the Himalayas. Oh! you are so nice,Arti. like to call me, instead of 'sir'. sorry for being late... enjoyed the pictures... the 1st one was brilliant... houses in the foothills of mountains... wonderful with the little snow... great mountains!!! I have indeed seen that movie, more than once!! It is loosely based on the novel '5 point Someone' written by Chetan Bhagat. Awesome collection Arti! You transported me to the hills... indeed, hills are symbolic of a serenity that is by far unmatched. New visitor to your blog; but felt like having known you for a long time because we have something in common - the love for Himalayas. I have been travelling and trekking in those parts for more than 25 years, but still has the same excitement when my eyes fall on the first snow clad peak. Btw, you could've given a better picture of Neelakanta. Many readers have mistaken the rock outcrop in the foreground to be the peak. Next time you go to Badri, take a walk through the path behind and to the left of the temple and you can get a closer and grander view of the peak. 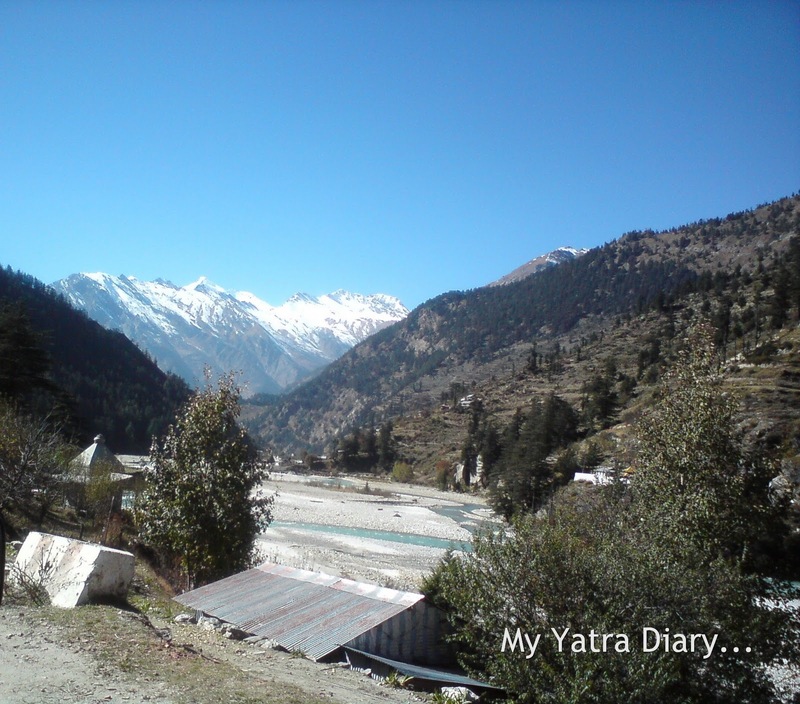 Your love and enthusiasm for Himalayas is evident in your writing. Thanks for sharing it!